The North Face has been creating innovative designs that push new technologies and inspire cutting-edge products for more than 40 years. To remain a customer service leader and enhance its web offerings, The North Face needed a top-quality online communication tool. 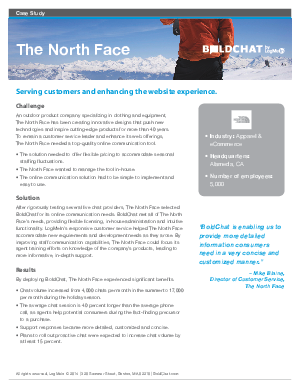 Download this case study to find out how BoldChat was the solution to the challenges that The North Face encountered.